This document provides an analysis and selection of energy performance indicators for the printing industry, as well as an outline of the proposed European benchmarking. This document is the second report delivered in the EMSPI (Energy Management Standardization in Printing Industry) project. It belongs to the Work Package 3 (WP3), in which the main objective is to define Energy Performance Indicators which can help companies assess their energy performance. Furthermore, this document includes as well a discussion of the European benchmarking indicators, which establishes the baseline for future comparisons between companies at the European level. Due to the actual lack of data on energy consumption in the printing industry, it is not viable at the moment to establish the benchmarking values, but it is possible to determine the indicators that may be suitable for it. At the end of the project, once the work with the printing companies is conducted, there will be more information available to establish the European benchmark. When the suitability of defined energy indicators is to be evaluated, the experience from the Work Package 2 (WP2) of the EMSPI project should be taken into consideration. A significant identified barrier for the work with energy management in graphic companies is the lack of intern prioritization, which is closely connected to the companies’ ability to monitor and analyse the energy consumption. In this context, the energy indicators play an important role, since the precondition for a company to work with continuous improvements is the company being capable of monitoring the performance according to the principles for PDCA under the frame of a management standard such as ISO 50001. 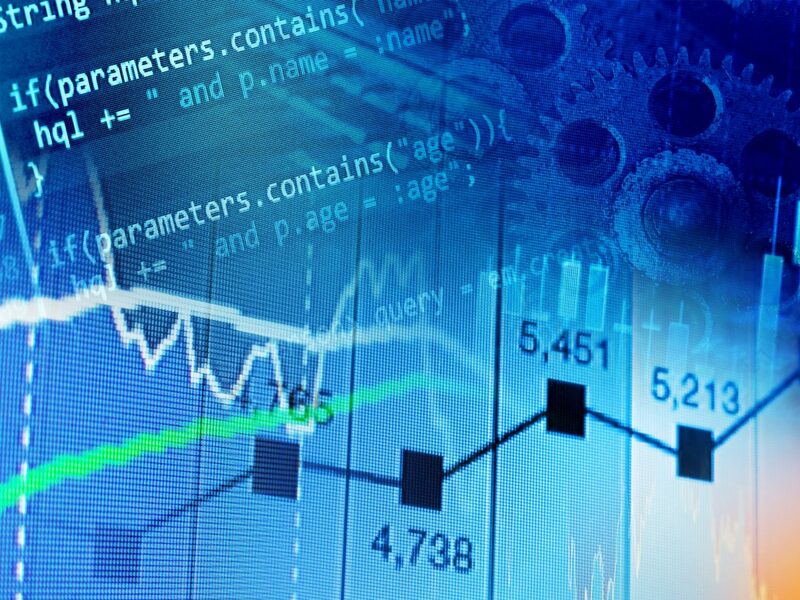 Therefore, the basis for working with definition of energy indicators should be that it is preferable for a company to have indicators that are not the most suitable than not to have indicators at all. 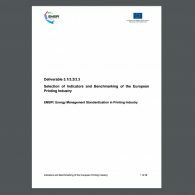 This document provides an analysis and selection of energy performance indicators for the printing industry, as well as an outline of the proposed European benchmarking. It starts with the definition of what indicators are focusing next on energy indicators in particular. Given the topic of this project, the most important indicators to be included are those related to the direct energy consumption in the companies. However also indicators which address other aspects of the energy consumption are included as well such as indicators for energy costs and indicators for indirect energy consumption. Furthermore, not only are the indicators described and analysed, their suitability as internal use and benchmarking indicators is assessed as well in the last section of the document, selecting those indicators which may be more suitable for these purposes. 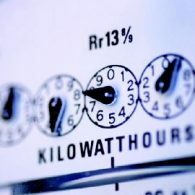 A theoretical ideal energy indicator provides stable information about the energy performance of a specific process without the indicator being affected by other conditions than the actual process. In order to make things 100% clear, let’s clarify the meaning of the word “indicator” in terms of energy efficiency: according to the ISO 50001 an indicator can be defined as “Quantitative value or measure of energy performance, as defined by the organization”. An energy indicator can be based solely on the raw data of the energy consumption in kWh, MJ, m3 natural gas etc. for a fixed period. However, in most cases it is relevant to define the energy indicator as a key figure for the energy performance, where the energy consumption is normalised to a fixed reference to compensate for the variation in production or climate conditions. A theoretical ideal energy indicator provides stable information about the energy performance of a specific process without the indicator being affected by other conditions than the actual process. However, such an indicator is hardly realistic in the real world, since the majority of indicators can be affected by external conditions and at times to such a degree that it makes the indicator unstable and unsuitable as management tool. 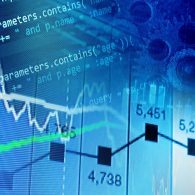 When companies define energy indicators they often experience that the most stable indicators are also those where the capture and analysis of data is most difficult. The suitability of the recommended indicators are rated according to the following scale: (1) High; (2) Good; (3) Acceptable. In order to create the most suitable indicators, an analysis of the conditions which may affect the indicators for the printing industry has been performed by the team in terms of (1) Size of production; (2) Energy consumption for the manufacturing process; (3) Synchronization of the data capturing; (4) Degree days; (5) Space utilization and (6) Height of indoor spaces. The energy sources and the access to data will vary between companies. As a consequence of this, the suitability of the recommended indicators are all rated according to the following scale: (1) High; (2) Good; (3) Acceptable. Furthermore, the team has already do the job of discarding the less suitable indicators for the industry being (4) Bad and (5) Useless, prioritizing the best tentative options which could serve as a base to start developing more specific indicators for the company implementing the EnMS. Furthermore, a number of examples for each group of indicators are presented, with the same objective of facilitating the amount of work to companies. The energy indicators are classified by the following categories: (1) energy indicators for the production process, (2) energy indicators for space heating, (3) energy indicators for space cooling, (4) energy costs indicators and (5) other energy related indicators. The suitability of these indicators for internal use is analysed by the team, as well as the conditions influencing the stability of the indicator for benchmarking purposes and the suitability of its use as a benchmarking indicator. In the description of the developed EnMS, the tentative list of energy performance indicators for printing companies are described. A long list of the proposed indicators will not be suitable for use as indicators in most companies. Therefore, the list should not be seen as a catalogue of possible indicators, but should be basis for selection of the most suitable indicators as foundation for the work that will be carried out during the ongoing project. It is remarkable that a different tentative list has been provided for basic model, and full model, narrowing the selection field for each one of the two different cases.